President Rodrigo Duterte on Tuesday offered Filipino citizenship to Rohingya refugees as he reiterated his willingness to accept them into the country. The arrest this month of Philippine journalist Maria Ressa, which experts say is a retaliatory move for exposing violence-inciting fake accounts on Facebook linked to President Rodrigo Duterte’s administration, raises the question of the company’s culpability for her dangerous predicament. China has warned the Philippines that recklessly deporting Chinese workers might affect the status of Filipino workers in China, Presidential Spokesperson Salvador Panelo revealed Tuesday. PENDING the transmittal of the 2019 budget to Malacanang, Budget Secretary Benjamin E. Diokno revealed on Tuesday that he already signed a memorandum on the national budget call for FY 2020. As the Cagayan Economic Zone Authority (CEZA) celebrated its 24th year anniversary, six projects worth a total of PHP1 billion and the USD4.5 billion (PHP234 billion) satellite city (Polaris) were unveiled in a series of groundbreaking ceremonies and inspections here on Monday. THE Philippine Health Insurance Corporation (PhilHealth) yesterday said the Universal Health Care (UHC) program is P22 billion short of its funding requirements. The Bureau of the Treasury (BTr) on Tuesday raised PHP113.772 billion from the year’s first rate setting auction of five-year Retail Treasury Bonds (RTBs). Butil Partylist Rep. Cecilia Leonila V. Chavez sought a congressional probe on the $85-million loan granted by the Land Bank of the Philippines to Hanjin Heavy Industries and Construction Co.-Philippines (HHIC-Phil). The Bangsamoro Transition Authority (BTA) formally assumed leadership over the new Bangsamoro Autonomous Region in Muslim Mindanao after the ceremonial turn-over of functions from the Autonomous Region in Muslim Mindanao to the new Bangsamoro region. THE Department of Health (DOH) on Tuesday vowed to continue to strengthen the information campaign on vaccination, disclosing that the P7.4-billion budget for its national immunization program in 2018 had a 98-percent utilization rate—a report that appeared directed at critics. President Rodrigo Duterte on Tuesday raised doubts about the ill-gotten wealth accusations against the late strongman Ferdinand Marcos who allegedly amassed up to $10 billion from state coffers during his two-decade rule. Sold. Rafael dela Cruz Consing Jr. is a senior vice president, chief finance officer and compliance officer of International Container Terminal Services Inc. (ICTSI), according to the port operator’s page on the website of the Philippine Stock Exchange (PSE). The Pasay City prosecutor’s office has indicted Senator Antonio Trillanes IV for inciting to sedition in connection with statements he made against President Rodrigo Duterte after the latter revoked his amnesty. The government may increase the volume of rice imports from non-Asean countries that can enter the Philippines at a lower tariff rate, according to the draft implementing rules and regulations (IRR) of the rice trade liberalization law. In 2017, natural gas provided 21.8 percent of the country’s total power demand. It also has the lowest generation cost compared to other sources contracted by Meralco. The government of Germany will consult with its European Union (EU) partners for “further legal and political action” against human rights’ violations and extra judicial killings (EJKs) in the Philippines. The Philippine Embassy in Washington, D.C. on Tuesday took “strong exception” to a Washington Post story that centers on the government’s campaign against illegal drugs. The Philippine Legislators’ Committee on Population and Development (PLCPD) and the Forum for Family Planning and Development Inc., will conduct a series of electoral fora dubbed “iChange: Vote for Reproductive Health and a Smoke-Free Generation” on March 12 here and in Tabaco City. Construction of a major stretch of the main road of Boracay Island has yet to start even as an increasing number of tourists are coming to the popular island-resort. Last Saturday, a pilot of a chemical sprayer plane was injured after his plane crashed into a banana plantation in Ampatuan town. Flyer Dennis Pandi was rushed to a hospital by employees of the Amardi Banana Plantation. President Rodrigo Duterte has threatened to shut down PLDT Inc if the telecommunication giant won’t set up more trunk lines to accommodate calls to a citizens’ complaint line for reporting corrupt government workers. A law allowing unlimited entry of rice from other countries has yet to take effect but this early, some markets are already selling imported rice at cheaper prices. Resonating the Duterte administration’s drive for social responsibility, five hectares of government land will be donated for the relocation of at least 2,086 informal settler families (ISFs) long living on Isla Puting Bato in Manila. Amid fresh round of escalating energy prices, investors and policy advocates of the propounded Energy Efficiency and Conservation Act are batting for the immediate signing of the propounded law and for it to be feasibly enforced the soonest possible time. SECRETARY Silvestre H. Bello III said the Department of Labor and Employment (DoLE) lacks the funding and manpower to issue special working permits (SWPs) to foreigners, after Congress last week proposed to give DoLE that authority. CITY OF SAN FERNANDO—A 72-percent increase was noted on the applications for registration of intellectual property rights (IPRs) in Central Luzon. The Quezon City government on Tuesday vowed to step up its efforts in ensuring a drug-free workplace through a partnership with the Philippine Drug Enforcement Agency seeking to eliminate drug abuse in private establishments. Almost 17,000 business establishments in this city have renewed or registered their firms in the first month of 2019, records of the City Mayor’s Office-Permits and Licensing Division showed. The Armed Forces of the Philippines (AFP) on Tuesday strongly condemned the latest atrocity of the New People’s Army (NPA) when rebels torched and destroyed heavy equipment, vehicles and other facilities of the Santa Clara Hydro Power Plant in Barangay Malvar, Naujan, Oriental Mindoro. Global payments service provider Visa sees more opportunities as the Bangko Sentral ng Pilipinas (BSP) ramps up efforts to increase cashless transactions in the country for a cash-lite economy. The Bureau of Customs (BoC) and Philippine Veterans Investment Development Corporation (Phividec) will be going after Verde Soko II Philippines Industrial Corporation for importing South Korean garbage in 2018. A group of 50 unidentified armed men and two women believed to be members of the Communist Party of the Philippines-New People’s Army (CPP-NPA) burned down some PHP3 million worth of heavy equipment at the Longa Hermosa Hacienda in Barangay Sta. Monica, Manjuyod town in Negros Oriental on Monday night. The Philippines gets to host the Red Bull Cliff Diving World Series for the first time as the competition series goes to the now famous Miniloc Island in El Nido, Palawan. AVIDA LAND Corp. sees at least P12.9 billion in sales from its fifth residential project in Makati City, where it hopes to attract young Filipino millennials working in the area. PHOENIX Petroleum Philippines, Inc. reported an 82% increase in net income in 2018 to P2.77 billion in what it called a banner year after generating record revenues and profit. Philippine National Police (PNP) chief Director General Oscar Albayalde yesterday ordered a crackdown on politicians using blinkers, sirens and other emergency devices in their campaign sorties for the 2019 midterm elections. The mega-hit Despacito by the Puerto Rican singer Luis Fonsi has become the most watched video ever on YouTube with more than 6 billion views, the Google-owned service said Tuesday, February 26. Unidentified gunmen shot dead two gun-for-hire suspects who were being transported by officers in a police vehicle on Tuesday afternoon, Manila Police District (MPD) said. According to Tina Panganiban-Perez on her report for 24 Oras, the Comelec is confident that VRVMs would easily identify so-called flying voters, in other words, those who are registered in multiple precincts. Among the Paris signatories, the Philippines pledged to reduce its emissions by 70 percent compared to projected levels by 2030. Compostela Valley province will present a list of 2019 big-ticket projects worth PHP3.295 billion during the “De Oro Biz iCon”, which will be held on March 5 at the Lubi Plantation in Kopiat Island, Mabini town. A local company and agricultural experts from India have teamed up to help boost the Philippines’ garlic production by planting the crop in alternative areas. MANILA Electric Co. (Meralco) posted a core net income of P5.72 billion in the fourth quarter of 2018, higher by 18.2% compared with the P4.84 billion a year earlier largely because of the higher power consumption during the last three months of 2018. Caloocan Bishop Pablo Virgilio David, a Catholic leader critical of President Rodrigo Duterte’s anti-drug campaign, has received death threats and has been advised not to return to his Caloocan City residence for now. Aboitiz-led Union Bank of the Philippines is raising another P30 billion via the issuance of bonds or commercial papers as part of its debt liability management program and at the same time augment the listed bank’s loan book. Listed independent oil firm Phoenix Petroleum Philippines Inc. booked its strongest earnings and revenues last year on the back of record fuel sales volume. The Police Regional Office (PRO) 7 (Central Visayas) on Tuesday threatened to press charges against protesters from different cause-oriented groups who caused a commotion in front of the police regional headquarters at Camp Sergio Osmeña Sr. here during a rally commemorating EDSA People Power. 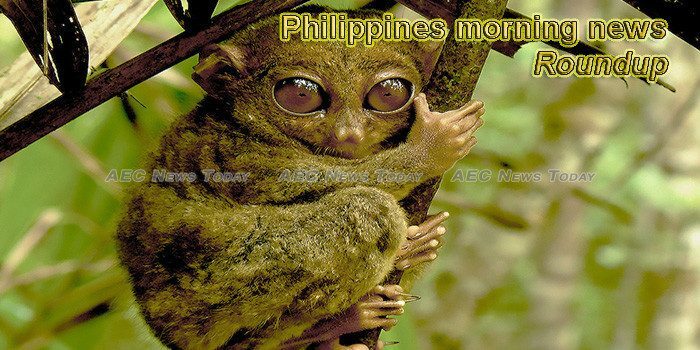 This week’s Philippines morning news feature photo acknowledges World Wildlife Day, March 3.